Steffen has tickets to Fox’s comedy show on April 17 and hopes to meet Fox for a quick autograph. This isn’t the first time Steffen has tried to track down celebrities he has tattooed on his body. 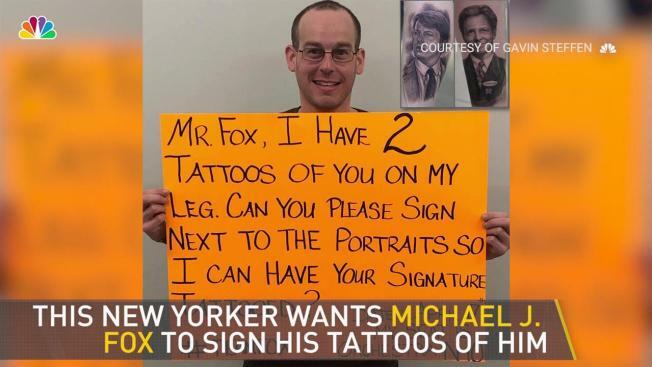 A tattoo fanatic wants Michael J. Fox to autograph his tattoo of Fox’s face this Wednesday night, so he might also get that tattoed. Steffen has tickets to Fox’s comedy show on April 17 at Manhattan's Kaufmann Concert Hall, and hopes to meet Fox for a quick autograph. At the bottom of his sign, Steffen wrote what section and seat he will be at during the show. Maybe Fox will be Steffen’s newest addition to his tattooed autograph collection.